"...... Well, what can I say! Amazing, Funny, Creative, Patient, Happy, Emotional, and stunning captures the most fantastic moments on camera that you wouldn’t think possible. Dirk was recommended to us through a work colleague of my Dads, who had recently been married. I looked on his website and instantly fell in love with his previous wedding photos, I just loved how natural they all were. So Daniel and I arranged to meet Dirk for a chat. As soon as we met Dirk the three of us just hit it off straight away, we had a good laugh and Dirk assured Daniel that he wouldn’t make him swing off any lampposts or do any ridiculous stunts or poses, Daniel was relived as he’s not keen on getting his photo taken at the best of times. Dirk also suggested that we meet other photographers!!! We thought he was crazy, but took his advice and we soon realised that Dirk WAS our photographer! The pre-wedding shoot was a blast, we asked Dirk to join us on the beach as we walked our dog Poppy. We all had a great time and discovered Poppy was the most photogenic of us all! Finally our big day arrived and Dirk was there every step of the way from the moment he arrived to the moment he left he was just buzzing with energy, cracking jokes making us all laugh and relaxed. During the hustle and bustle of the bridal party getting ready, Dirk was on hand with no task too big or small. “Dirk, have you got a tissue?”. “Dirk, has Daniel arrived yet? You could almost say that Dirk was my 5th bridesmaid!!! Dirk was fab, he kept us all calm, chilled out and relaxed. Throughout the day I would catch him out of the corner of my eye taking photographs which were soon to become our only memories of the day. 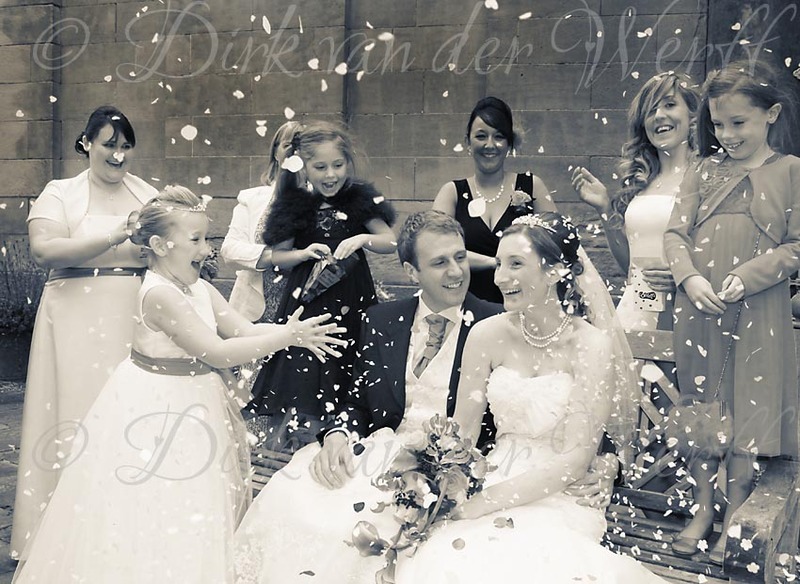 When we saw our 'sneak peek' photographs on Dirk’s blog, we were over whelmed by how fantastic they were and how well Dirk had captured our story. The only problem now is trying to select our favourites for the album - I wonder if I can choose them all? We would just like to say a massive thank you Dirk for being apart of our special day and capturing the most wonderful memories.